It's not often goldfish are seen as anything but docile house pets. But the beloved little creatures often purchased for children at pet stores and given as carnival prizes are now invading Lake Tahoe. According to Northern California newspapers and television station reports, goldfish as large as 14 inches and weighing as much as four pounds have been sighted by lake visitors and studied by researches at the University of California, Davis. According to the Sacramento Bee, the large goldfish are taking food and space from the lake's native species. Christine Ngai, researcher at UN Reno. 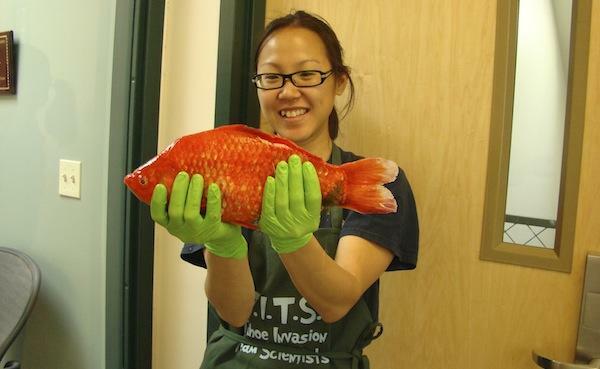 showcases "gigantic" goldfish. "They didn't have any predators, so they were able to grow up to 14 inches and four pounds," Kevin Thomas, an environmental scientist at the California Department of Fish and Wildlife, told the newspaper. The newspaper and Sacramento-area television accounts detail Lake Tahoe residents for several years reporting "gigantic, bright orange creatures." "It's not atypical for a strain of goldfish to get to a larger size," said Christine Ngai, a researcher at the University of Nevada, Reno, told the Bee. "They are like humans; some are taller or shorter." The goldfish population in the lake likely began when the fish were used as bait or when they were dumped in the water for unknown reasons. Since the goldfish are invasive and don't have predators, wildlife officials are removing them from the lake. One report noted that 88 goldfish have been removed so far.